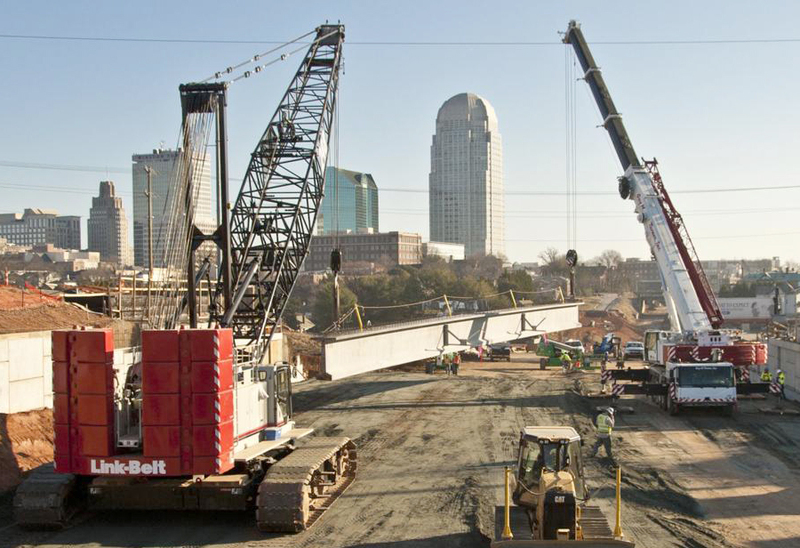 Massive concrete girders were slowly lifted and eased into place at the site of the new Broad Street bridge under construction downtown Winston-Salem using a Link-Belt crawler and a Liebherr All Terrain Crane supplied by Guy M Turner. 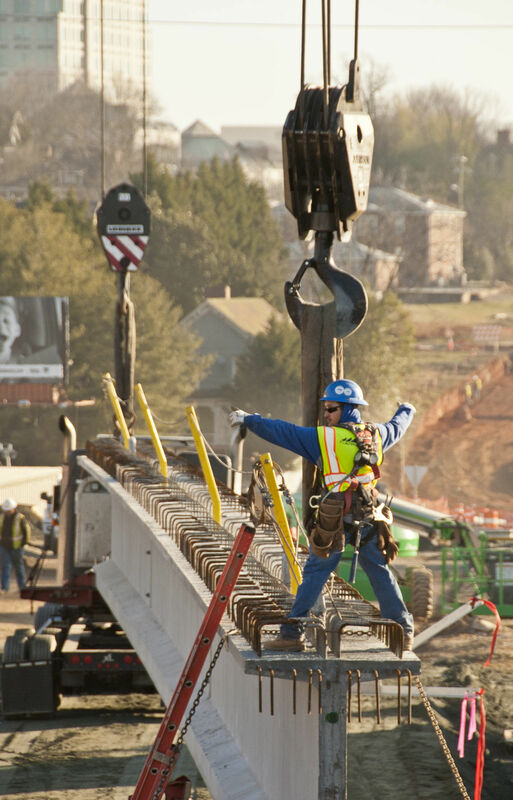 Trucks pulling the 60-ton girders on special trailers used the old Business 40 roadbed to approached the construction area on Monday, and iron workers from Flat Iron Construction began putting the girders in place Tuesday morning. The two cranes coordinated movements in tandem to pick up each girder from the trailers and lift it suspended in air to the waiting abutments. There, construction workers used hand signals to tell the crane operators to slowly go further, further, further — then stop. 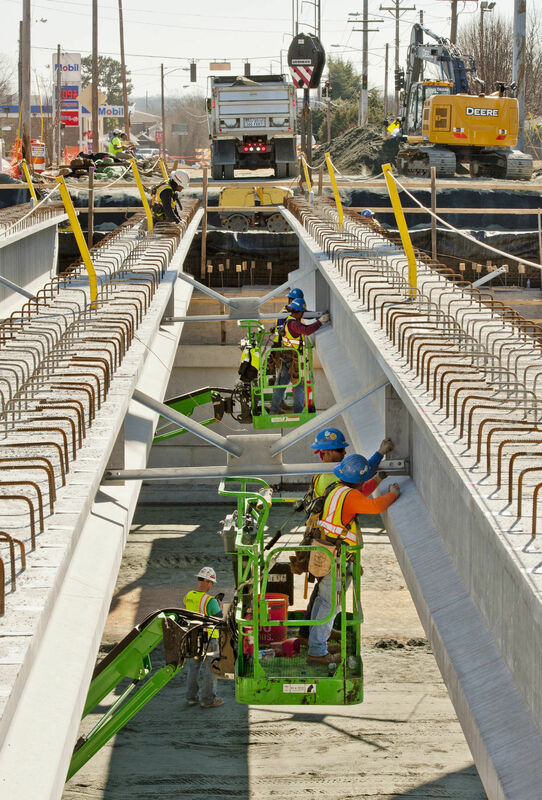 Once the girders are all set, it will be a couple weeks before workers can start the process of pouring the concrete deck for the new bridge. Although the weather has been wet, Shaver said, it has not slowed progress on the Business 40 project overall, although some of the work has been shifted around because of the weather.